Let's start with the travel! Similar to last year, we took the commuter train an hour north of the city. It's really convenient, but the trains run about every 2 hours, so lining up the agenda of your day is important. Getting to and from the train station can be a bit tricky since uber's aren't as common, but we discovered the rail trail which takes you right from the train station to the downtown / harbor area with about a mile walk. The trail is filled with historical tid-bits and architectural pieces along the way. The shuttle was supposed to be running starting Memorial Day Weekend, but we didn't see any which worked out because we wouldn't have discovered the trail! The Tall ships are a big draw to the town! The Adventure & The Alabama are two of the tall ships that were being viewed / toured during the Memorial Day holiday weekend and we were able to enjoy a little history lesson while aboard. Both are still active in terms of doing charters & sails, but the history of these ships dates back to the early 1920's! Crazy to think they have held up so well! Obviously, I took my opportunity "to (wo)man the ship" & the crew could not have been more nice about all the question we (read Gary) had! One of my favorite parts of Newburyport are the cute little shops up and down State Street! It's stores like these that you can get the most amazing locally made gifts! We popped into Port Blue Accents which is the home decor and accents part of Port Plums. Gorgeous hand crafted wood pieces, one of a kind leather goods & the most amazing smelling candles that are hand poured and all locally made!! We stopped into a few more stores along the way to lunch including Coast & Country! I'm a sucker for anything nautical and they had some of the cutest mermaid inspired accessories I've seen! All that walking & exploring always works up an appetite and I was so excited to try out Michael's Harborside. We actually wanted to eat there last year but it didn't work out so I was excited to finally try one of their lobster rolls!! Gary was way more adventurous than me and taste tested a few of their raw oysters & I stuck to my trusty order of a lobster roll with truffle oil parmesan tater tots. At this point it might not be a surprise that I am a lobster roll connoisseur and this one had the most perfect lobster to mayo ratio - meaning there was just a dash of mayo and the rest was perfect lobster! The views from Michael's are perfect - especially when the weather is nice & you can enjoy a cocktail and fresh seafood on their deck! We had the best time in Newburyport again this year and I'm thinking this might be a yearly visit for us. Thank you to Newburyport Development & Michael's Harborside for hosting us for the day of exploring. How was your holiday weekend? Link up below to share them with us! Disclaimer: We were treated to complimentary tickets for the tall ships & a lunch at Michael's Harborside. All opinions are 100% my own. What an awesome day trip!! I love all the pictures, and of course that lobster roll.....I'm drooling!!! The perfect day trip! That food sounds wonderful. I would've tried the oysters also! How fun!! Newbury Port looks beautiful and love all those shops! Those oysters and lobster rolls look so good!! Such a cute little seaside town! Loving that Alabama ship haha! I think day trips are the best, and yours looks so fun! I am drooling over those food pictures! Everything looks absolutely delicious! What a fun day trip! What a fun day trip and cute town! That lobster roll looks delicious! ahhhh these photos make me miss the NE! from the cute shop with handmade goods (fav!) to the boat tour and train. and that lobster roll. omg. it's hard to find that perfect ratio! now i'm hungry and want to travel haha. what a great sunday trip! I love when you write about this cute little town! And your pictures are all on point - you took some great ones during this trip! So fun! I need that let's be mermaids bag! It looks like you had a wonderful time, girlie! 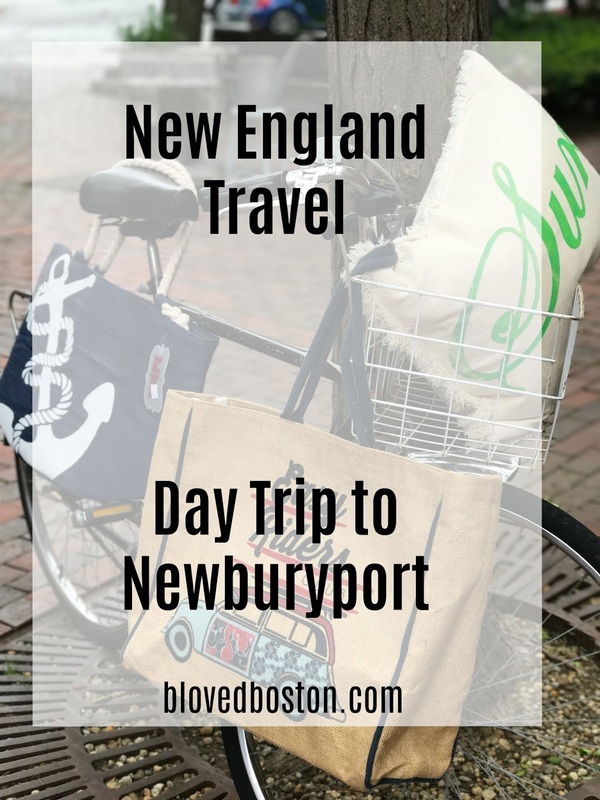 I've never been to Newburyport before, but you have me interested in going either this summer or next year; it looks so charming and historic there! I think the fact that you're able to explore the ships is so cool and I love that there's so many local shops you can snag original and unique finds, while supporting local businesses. Thanks for sharing, beauty, and I hope you have a wonderful week! Day trips are the best because you get to explore and then sleep in your own bed :-) It look's beautiful up there! My mouth is watering over that lobster roll! SO fun! I love a good day trip and an adorable New England town! I'm ready to jump through my computer for that lobster roll! What a cute lil town, the food looks delicious! What a fun little day getaway! I'm definitely hungry now after seeing that delicious food! A day trip is perfect for the long weekend! That photo of you on the boat is fabulous - I love your sunglasses! Those shops look darling too. What a fun trip! Looks like such a cute place. As always the food you ate looks AMAZING! What a fun weekend!!!! Getting to see those ships still in action had to be pretty cool! And the shops that you visited look so fun. And the food!!! Girl you know my favorite thing about traveling is trying all the foods! Sounds like you had a great trip! Nothing better than a quick day trip! Well maybe a full vacation...This looks like such a cute little town. Such cute shopping and that food all looks delightful! Glad you had a great time! I absolutely love Newburyport!! I am a south shore/ caper girl, so I don't get there enough, but it is so beautiful with tons of things to do. Looks like you had a blast. Beautiful photos Biana! Those views and food look amazing. I love how quaint those stores are. My weekend was awesome! Busy but awesome! Spent a lot of time with loved ones. Glad you had a great weekend trip! What a quaint little place! I've never been a huge fan of seafood but I've always wanted to try a lobster roll... this one looks AMAZING. We were there on Saturday! Chilly weekend, but one of my favorite little towns! This looks like so much fun! Cute shops and good food - I'm in! You just make every trip look so chic & fashionable & FUN!!!! What an awesome place to do a little day trip of exploring and the weather turned out to be so nice on Sunday. I wasn't quite sure where Newburyport was located but I see now it was a little tricky to get to and from. Adore the photo of you steering the boat...you looks gorgeous! The different sites, cute shops and those yummy lobster rolls sound like a perfect little adventure somewhat close to home. What a fun weekend! It seems like living in the Northeast is so perfect for these little getaways! These are fantastic pictures, especially love the boat ones! You look gorgeous! Sounds like you have so many cool places to take day trips to in the Spring/Summer! Sounds like such a fun day trip! And now Im craving some fresh oysters! OMG that lunch looks divine! I am from Maine but have never spent time in Newburyport! Ok you look absolutely gorgeous in all these pictures! It looks like such a pretty place and food SO YUMMY! Also--I saw your Insta post yesterday and CONGRATS on the new house!! How cute are you? Gorgeous!! Love these photos and I'm seconding Kelly - congrats on the house! Newburyport is such a fun place. Michael Harborside has great food. Glad you two had fun. What a fun little day trip! You look so cute! You guys always eat the best food...that lobster roll looks delish. Newburyport is nice, but I like Rockport better. More shops. The views are so beautiful and it sounds like you guys had SO much fun! I don't think I've ever been there! But I loved seeing it all, so thanks for taking us along with y'all!! What a fun day trip! Looks like a fun day trip! Love all the photos! Looks like it was such a fun weekend! Perfect way to spend Memorial Day. I love those sunglasses on you! And wow, does that lobster roll look good. 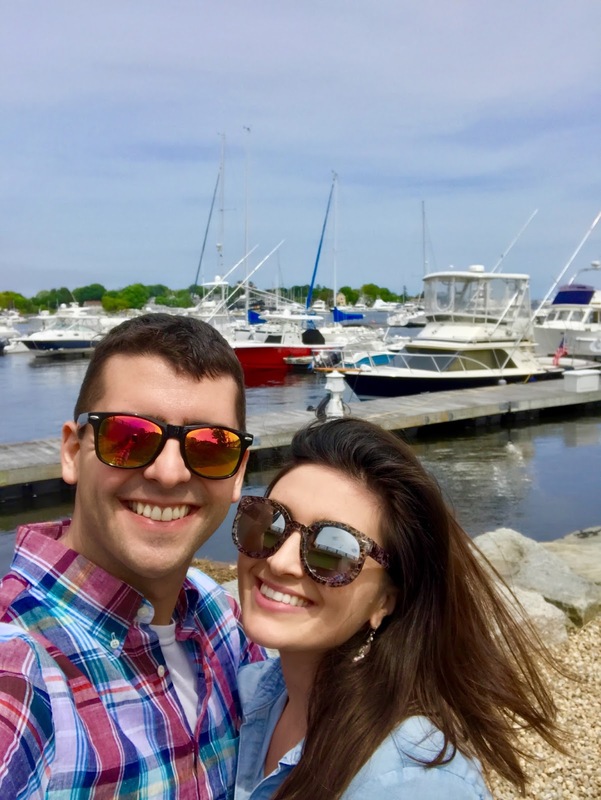 Will definitely have to add Newburyport to our list of places to visit next time we are in New England! What a fun and beautiful town! Those historical ships are really neat! Every so often there are some that sail around Michigan and since we live close to the water we get to see them (although I've never been on board)! I always love shopping in those cute quaint little towns, too! Isn't it the best?! 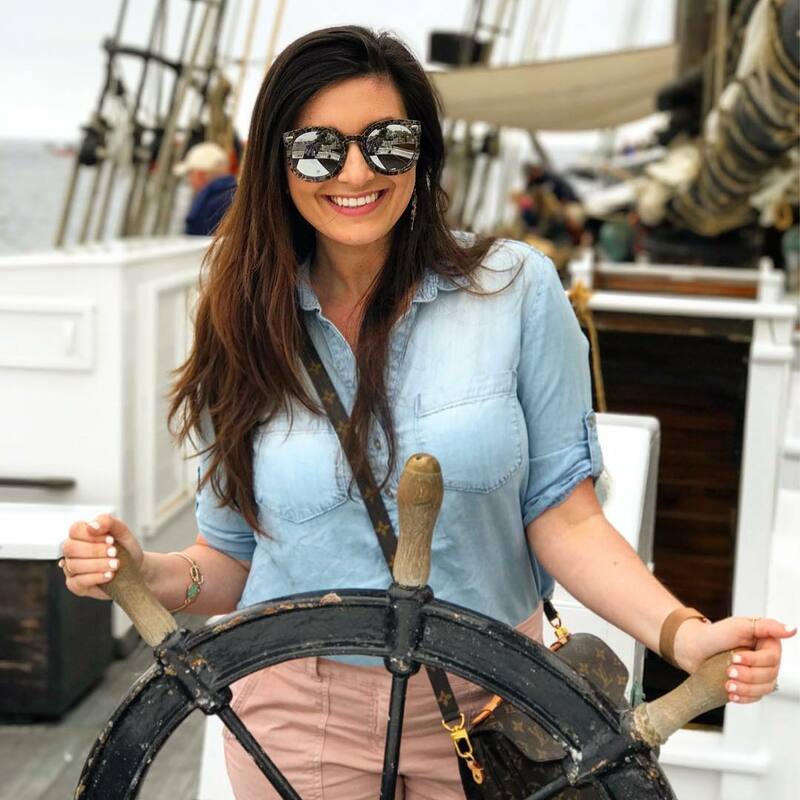 The tall ships were so fun to see, and you can neverrrrr go wrong with lunch at Michael's! SO fun! I love little towns like this and I think train travel is my favorite, plus being able to just walk around everywhere. I'm slowly getting more adventurous with my seafood, and still the only time I've had lobster was in Boston (ravioli-yum! ), but maybe soon I'll venture to try a lobster roll! Contact a evening dress dresses to wear to a weddingthat specializes in prom dressjust dresses donations, such as Becca's Closet or Catherine's Closet. Charities such as these were created just for girls who can't afford their own. Clean your dress and inspect it to ensure there are no tears or rips. The general rule of thumb is that if the dress' condition isn't good enough for you to wear to 2016 , it's not acceptable for Order.